Despite our best efforts to help our patients and to educate the public at large about how to take better care of their spines, life happens. Bad habits are hard to break. For many people, the environmental conditions and physical demands they face at work (bending, twisting, shuffling items from left to right countless times in a work day) ensure Chiropractors like us will always be needed. While we’ve written before about how sitting for hours on end is bad for you, standing can be just as bad. That’s why it is so important to use an anti-fatigue mat. It doesn’t matter if you work retail, behind a service counter, or on a plant floor – if your job requires you to stand for extended periods, you need one. Prolonged standing can contribute to a variety of musculoskeletal disorders with symptoms that include fatigue, leg cramps, and lower back aches and stiffness. It can also contribute to chronic pain in the joints and varicose veins. But how does a mat make a difference? When you stand without moving for an extended period, blood-flow is reduced. The body consumes more energy trying to force blood through, which results in pain, stiffness, and fatigue as you tire. When you stand on an anti-fatigue mat, your body is constantly adjusting to keep its balance on this flexible surface. These micro-movements of your leg muscles, even if you don’t notice them, are enough to keep the blood flowing and reduce the rate of fatigue. This keeps you more alert, more productive and, most importantly, pain free. Of course, the best solution is to just move. Even if your job prevents you from leaving a station, you can still shift your feet, rotate your neck and shoulders, and thrust out your chest on occasion. This will help you avoid the muscle stiffness that can contribute to the spinal problems that lead you to our door. Sitting, even if with good posture, takes its toll, too, just in a different way than standing. Reduced blood circulation is also an issue here. Your hip flexors shorten, affecting your flexibility and range of motion. 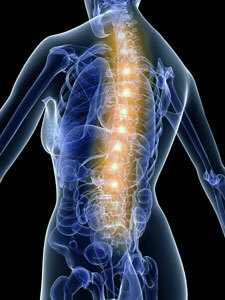 The discs in your spine compress, which can contribute to premature degeneration and chronic pain. And the longer you sit, the more likely you are to slump and lose good posture, which comes with its own set of negative consequences for your spine. Ultimately, our bodies were not designed to stay fixed in any one position for an extended period. We were built to move. Whether you sit or stand, it’s important to take a break of even a few minutes at least every hour to stretch and get that blood flowing again. If you have any questions or want to schedule your next chiropractic adjustment, call us today!